Christmas in Stockholm is a time of cosiness, flickering candlelight, loads of food and drink, and some very special traditions that range from solemn to silly. There’s enough going on in Stockholm at Christmas time to make a daily calendar burst, but there are some things that visitors or newcomers must absolutely experience when they’re in the city during the holiday season. 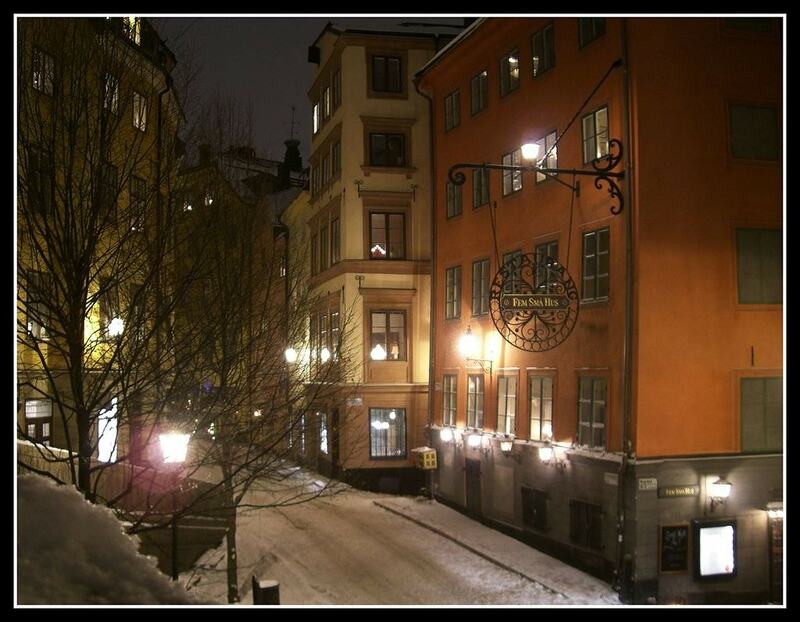 Gamla Stan (Old Town) is full of charm and plenty of things to do any time of the year, but during the lead up to Christmas, there is a wonderful walking tour that takes people through the cobblestone streets by lantern light. For 75 minutes, tourists will be treated to a blend of local history and Swedish Christmas traditions as they wend their way through the alleys and streets of one of the city’s most popular areas. Swedes love a good Christmas calendar and it’s a big tradition for kids big and small to wake up each day from December 1, open a window on their calendar, and enjoy the sweet treat that is revealed. There is even an insert on Swedish television each evening that features a Christmas calendar. Stockholmers have taken this a step further with the Living Advent Calendar. Each day, a window somewhere in Gamla Stan will open at 6:15 pm (on Christmas Eve, it opens at 11:30 am) and one or more heads will pop out—an actor, a singer, a storyteller—and offer 15 minutes of delight. To find out where the surprise window opening will be, look out for banners hung from windows that say Här öppnar luckan. Stockholm Christmas markets (julmarknad) are, quite simply, a delight. With food, drink, and plenty of gift-buying opportunities, locals and visitors alike could explore the many markets the city has to offer for days. There is so much on offer as craftsmen and women sell their wares, traditional winter food such as smoked or cured fish are available, and then there’s the old-fashioned Swedish candy that one doesn’t see much during other times of the year. Among the best are Skansen, Old Town, and, for something a bit different, Färgfabriken and its showcase of emerging local jewellery designers like Toini Berg. Lucia might be an Italian saint, but Swedes have claimed her as one of their own. Celebrated on December 13, Lucia involves young women wearing lit candles on their head (as well as carrying candles) while singing the Lucia song. This annual event is so popular that there is a national competition for the ultimate Lucia as well as smaller local competitions. Nearly every school and plenty of offices hold a Lucia concert. There are even impromptu Lucia performances around the city, particularly around Drottninggatan. A celebration to bring light to the dark winter days, there is something magical about the whole thing. Those in Stockholm on December 24 (the day Christmas is celebrated in Sweden), be sure to get to a TV by 3 pm. Why? At 3 pm, much of the country halts all Christmas-related activities such as cooking, present wrapping, or snoozing in order to watch the annual airing of old Disney cartoons, a tradition that dates back to 1959. Kalle Anka is the Swedish name for Donald Duck and while the tradition is said to be slightly less popular than in the old days, it seems that calls to emergency services drop by around 20 percent between 3 and 4 pm on Christmas Eve—which just happens to be the hour where everyone is glued to the telly to watch the same cartoons they’ve been watching each year for their entire lives. Vegetarians and vegans, be warned: the Julbord, AKA Christmas table, is a carnivore’s delight. 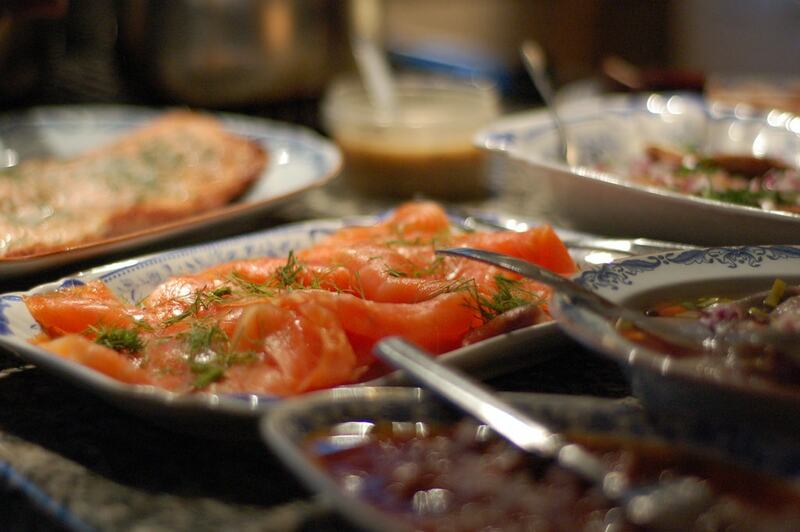 The Christmas ham (julskinka) takes a prominent role, but there is also sausages called prinskorv, meatballs, ribs, fish, smoked salmon, and more. Enjoy a julbord at an enormous amount of restaurants in the weeks leading up to Christmas and while a traditional one is always popular, ethnic restaurants are increasingly getting in on the act and offering a twist on tradition. Note that julbords are incredibly popular, so those keen to experience one (particularly at some of the more popular venues, such as Grand Hotel) should book ahead. Also note that a traditional Christmas table involves much drinking, including loads of toasts with snaps, which will then be washed down with beer or wine. Nearly every church in Stockholm holds a series of Christmas concerts leading up to the big day, and quite a few of the schools do as well. The concerts are very popular, particularly if they’re held at places like Storkyrkan, the English Church, or one of the music schools, so tickets should be bought ahead. If that’s not possible, get there early to grab a seat before they’re all gone. 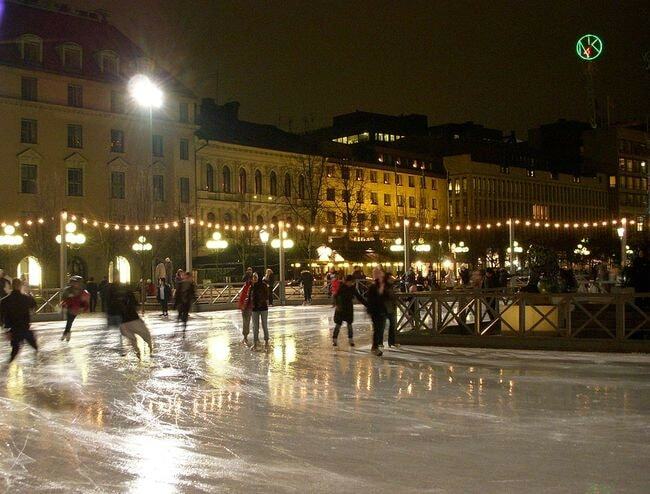 Stockholm has quite a few free outdoor skating rinks where skaters can glide across the ice under the sparkling lights that are on nearly all day due to the winter darkness. At some, like Kungsträdgården, people can rent skates. Others, such as the one at Vasaparken, require skaters to bring their own skates. Those looking for a pair can pick up a cheap pair at sports shops like Stadium or Intersport. Kungsträdgården also has refreshment kiosks onsite and the entire area is surrounded by restaurants, cafés, and bars. Perched on the edge of the water at Skeppsbron just at Gamla Stan, this is the tallest Christmas Tree in the world, measuring 38-meters (124.7-feet) high, decorated with some 5,000 lights, and crowned with a 4-meter (13.1-foot) star. It’s one of many public Christmas trees scattered around the city’s squares, parks, and even in the middle of Lake Mälaren, and it’s definitely the most impressive. See it up close to believe the sheer magnitude of it. When Christmas approaches, the calendar fills up with invites. Go to a party with glögg, a mulled wine, gingerbread cookies, and often saffron buns. Since nearly everyone hosts one of these parties at least once during the holiday season, it’s not very hard to snag an invitation. Just remember that glögg is not like mulled wine in the UK or other countries; it’s stewed with cardamom, cinnamon, ginger, dried Seville orange, and cloves, and sipped slowly from tiny little cups. That said, once tradition is out of the way, the host or hostess will most likely pull out the wine and harder stuff, which is when the real fun begins—often accompanied by dancing. Like in many cities the biggest, most glamorous department store in Stockholm’s Christmas window display is a much-anticipated event, particularly for the kids. 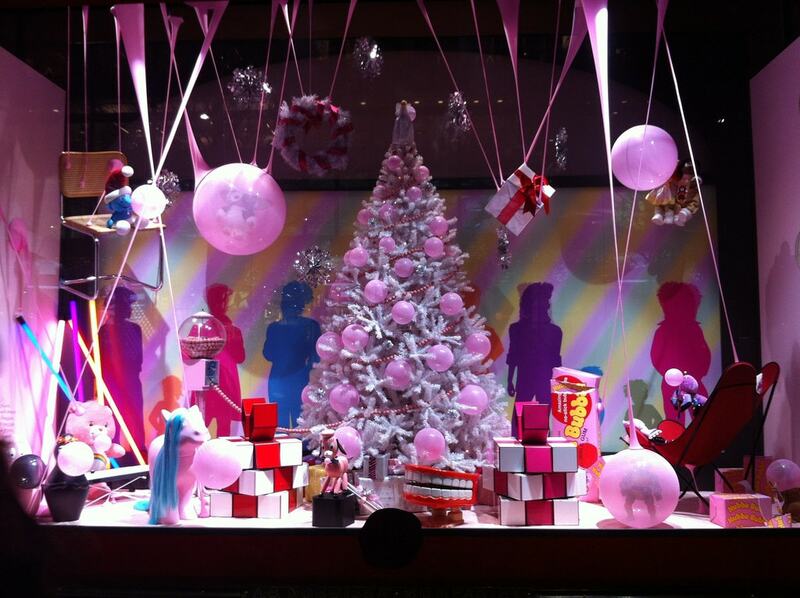 Other stores may try but no one does it better than NK (Nordiska Kompaniet) and the team behind the series of windows planning magical displays nearly a year in advance. The crowds are big so get there early or go at night when the kids are asleep, the sky is dark, and the lights are especially twinkly.